Whether you're taking an Avalanche Safety course or habitually digging pits, you can benefit from the Brooks Range Folding Ruler. If you need more than a meter of length because the snowpack is deep, Brooks Range's 200cm ruler is the obvious choice. It also has enough markings to get precise in your studies. Folds down to a mere 9¼” (23.5 cm) in length. Each section snaps to right angles, or in-line. Red highlights mark every 10cm on the metric side and every foot on the imperial scale which lets your quickly and accurately measure the layer depths. Despite only making it into the pack for courses, this ruler has close to daily use. It looks fashionable on the desk, and it a lot more fun to use that a measuring tape, especially when visualizing dimensions or working on tricky construction problems. Has not broken yet, which for a measuring tape is a pretty good track record. Wish there was a 400 cm version sometimes, but the 200 fits easily in a pocket and is easy to handle. If you're really (really (really)) into digging pits all the time, then these folder rulers can be helpful. 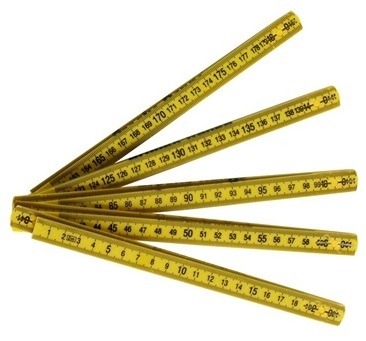 And initially I dutifully bought such a ruler. But then I just started using my probe. Even when teaching avy courses, I now just use my probe to reference snowpack height measurements.